In a world where truth is often obscured by cover-ups, lawsuits, and oft-told lies, it’s always refreshing to meet someone to whom the truth matters. Konstantinos Koskoletos is one of those individuals. His book, Miseries of Occupation, is essentially a ‘hero’s journey’ – a quest for the truth of what happened to his beloved father during the Nazi occupation of Greece – or to use its rightful, name Ellas – and the devastating and destructive civil war that followed. For 70 years he fought to vindicate his father and the sacrifice he made trading places with another when nationalist fascist forces murdered seventeen men they accused, without proof , of being communists on the island of Aegina. Mr. Koskoletos’ life and quest are the crux of his book, but the book also reveals a vibrant and interesting writer as well. Now at age 80, his haunting and compelling book has been translated into English, but its prose, even translated from his native Greek, is powerful and heartbreaking. The extraordinary lengths the young Mr. Koskoletos went through to get an education are amazing, and the lengths that his toxic uncle and grandmother went to undercut his entire family are infuriating. He is currently having a new book published in Greece, with a forthcoming English translation, and is at work on a third that covers the extraordinary means that his uncle’s family went to have his book suppressed. Four court cases – and nine years later – the Greek Supreme Court negated the lawsuits and agreed that Mr. Koskoletos was free to tell the truth as he remembered it. We were very interested in asking Mr. Koskoletos to let us into his writing world and give us some insights as to how he became a writer, his quest for justice, and what he’d like English speaking readers to get from his works. His wit and wry humor are infectious. Since I got to know myself, writing pulled at me like a magnet. At the age of ten, I was breaking into my Uncle Aristides’ home…stealing his books! Writing uplifts my spirits and rejuvenates my wits. Writing is the most creative accomplishment anyone can achieve. Research – historical or scientific – is the most important. The time it takes to research varies, depending on the nature of the story. For example, my new book, ‘Beyond the Horizons’, required endless hours of investigative research. At times I do my exploration even as the story unfolds. Why not just fulfill your quest to vindicate your father and be done? Why write about it? My goal in writing Miseries of Occupation was to bring to the public’s attention a government-sponsored crime that should never had happened! And to remind everyone of our devastating Civil War, which affects the lives of us all, even today in different parts of our small world. You went through many court cases for Miseries in Greece. What caused these cases and how did you reconcile with your accusers, if you did? My sole purpose in writing Miseries was to reveal the truth and nothing but the truth. Court cases occurred because some people wanted that truth locked in the closet. My greatest reward through this long ordeal was that the Greek justice system took the side of Freedom of Speech. How did you select the mythic names of your characters? What significance did you place on each one? Most of the names I chose were selected from Greek mythology. Each represents a true character in Miseries. For example, Ipoliti (Hippolyta) was the queen of the Amazon women warriors. Penelope was Ulysses’ faithful wife waiting his return from Troy for twenty years. Ureklia was a servant in Odysseus Palace, and Leonidas was named after the legendary king of Sparta. Uncle Iaveris? He was the shrewd and cunning Police Inspector Javert in Victor Hugo’s masterpiece Les Miserables, relentless and single-minded, focusing on his own purposes and never on the larger picture. We saw the video of the memorial for your father and the others in Aegina. (https://youtu.be/WLgCrzgKQRE) What prompted you to have a priest bless the site, since your own uncle was a toxic sort of priest? In Greek Orthodoxy, you can’t do memorial service without a priest. Not all priests are the same. Most are honorable men, with faith and commitment to the church and their families. Sadly, Uncle Iaveris wasn’t one of them. Do you still harbor any resentment? Not resentment. Only sorrow for those who commit atrocities against innocent people and a prayer that it never happens again. What is your new book about? How did you go about writing it? My new book, Πέρα απ’ τους Ορίζοντες, (English, Beyond the Horizons) is an epic tale which takes the reader to faraway lands: from far-out North Alaska through stunning Northwest America, all the way to the distant corner of Asiatic Turkey. So far the reviews of the Greek version of the book are extraordinary, beyond expectations. It took ten long and stressful years to do it, and four trips to Asia Minor, with lots of research and lots of epic battles, like Achilles’ duel with Hector outside the walls of Troy, and the mother of all battles, the bloody Sagarius River battle. This battle was fought for four days in the river’s deep, choppy waters. Fourteen thousand Turks and eighteen thousand Greeks died in that ferocious clash, as told to me by an old eyewitness war veteran who managed to survive named Pappou Stavro. To do an appealing story the writer must be emotionally involved. A writer’s task is very difficult. He or she must make many sacrifices, and be prepared to spend lots of time totally isolated….at times months or years. Each book is different and must stand on its own merits. What authors do you dislike? I don’t appreciate authors who spend time doing books with no educational value. A thesis I did in my early high school years became the talk of the town. The proper use of language, combined with the use of the pen, can become a lethal weapon. If I say what I think of one particular under-appreciated novel, I’m risking another lawsuit against me! Anxiously waiting to have my next book Beyond the Horizons published in English. It’s already translated from Greek to English, though it needs editing. Its future depends on how Miseries will do. In between, slow but sure, I’m planning my next tale, the title will be The Trial of the [an] Author. It will be a catapult against all those trying to hide the truth… or trying to muzzle the freedom of speech. A successful story makes the author feel great! Uplifts his spirit. Also the sentimental satisfaction the writer feels that in life he leaves something behind for generations to enjoy and benefit from. Take the Greek version of Miseries. The 150 letters and 500 telephone calls I received from enthusiastic readers from all across the country – it’s a treasure beyond thought. Besides the fact the book was highly recommended by the publishers for school use. That’s gold for the author. Yes I do. I respect and value each and every opinion, positive or negative. No hidden secrets by me. I write with an open mind, and I become one with the protagonists of the story. I share their happiness, I share their pain. Herodotus and traveler Pausanias are only two of the many ancient writers I admire the most. To those great ones I won’t hesitate to include Ernest Hemingway. In Miseries, it was the Mock Trial. For a ten year old to be in a military courtroom while his father’s life was lingering on a thin hair, that’s too much to cope with. I wish no one ever has to live through a similar situation. 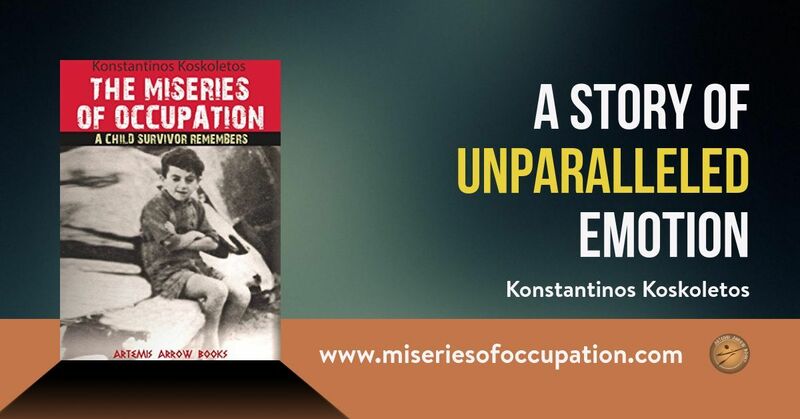 Kostantinos Koskoletos’ book Miseries of Occupation: A Child Survivor Remembers is now available in its English translation from Artemis Arrow Books and Amazon.com.